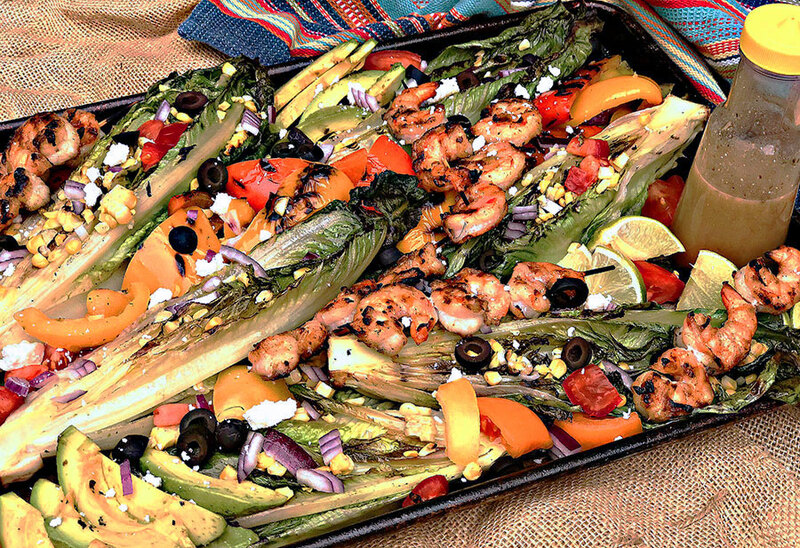 Dressed up or down as you’d like, grilled romaine is as quick a side as you can fix … but watch it closely, it is ready in a flash! Whisk dressing ingredients together until blended and set aside. Toss shrimp with cumin, brown sugar and ¼ cup oil. Slide onto skewers. Grill over hot coals about 3–4 minutes on each side until done. Brush lettuce with ¼ cup oil. Grill 1–2 minutes on each side just to get a light char. Remove to serving platter. Brush corn and peppers with ¼ cup oil. Grill until corn is roasted and peppers are a bit charred. Remove and let cool. Cut corn from cob. Scatter toppings and shrimp about lettuce on platter. 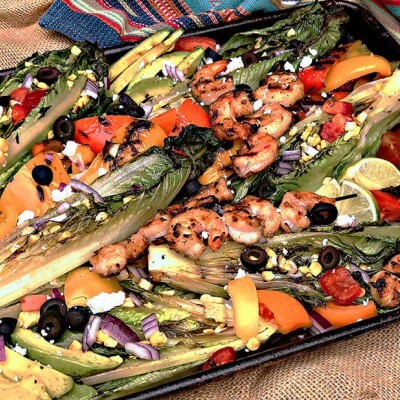 Just made this for dinner, used the indoor broiler for the corn and a cast iron skillet for the shrimp and romaine. Perfect summertime salad entree, loved it. Easy to make, from start to finish we were eating in 30 minutes.